I have to credit my Mom for this photo opp, as she pointed the rainbow that formed in the sky out over the coastline just north of where we were standing. I would have missed it completely! I am a sucker for a good rainbow, and the environment in which this pretty little splash of color decided to make its brief appearance could not be beat! Very pretty, and such a dramatic landscape! Gorgeous rainbow capture! Have a great weekend! Wow, perfect location for a rainbow!! The Oregon coast is simply beautiful. Yes - a great capture indeed. Congrats to your Mother for being so alert to the opportunity and to you for a lovely shot. Very pretty - great shot! Rainbows remind me of hope. Beautiful photo! Rainbows are always a delight! Great shot! 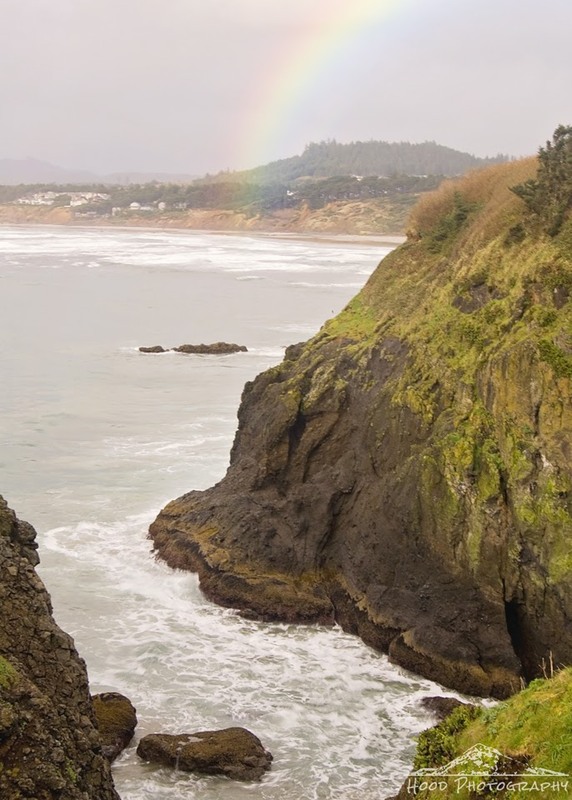 It makes me miss the Oregon Coast, great shot!